The Loomis-Michael Observatory Telescope — located on the tenth floor of Harvard’s Science Center — is undergoing a series of improvements that student astronomers say will renew and revitalize its role on campus. The improvements include a thorough cleaning of the lenses and a mechanical repair of the hand paddle, which allows for fine control of the telescope’s movement. The astronomy department has also authorized improvements to the observatory’s dome and the telescope’s pier, which is used to support the telescope. The changes are minor, but long overdue, according to Student Astronomers at Harvard-Radcliffe President Rodrigo E. Cordova ’19. Prior to the improvements, observers could see the dust on the end of the telescope when looking through it. The hand paddle, meanwhile, had been broken for most of STAHR’s institutional memory, according to Cordova. Cordova laughed when recalling having to manually adjust the instrument in past years. “I remember teaching a class and having to say, ‘If it’s almost in the center but not quite there… just pat it,’” Cordova said. The Student Astronomers at Harvard-Radcliffe, a student group known as STAHR, recently announced that the Loomis-Michael Observatory is under repair. Cordova added that the telescope’s recovered capacity for fine, mechanized adjustment will allow the club to pursue its burgeoning interest in astrophotography. Funding for the repairs comes out of the Science Center’s facilities budget. Some repairs, like the fixes made to the hand paddle, have already been completed. The upcoming repairs will not interfere with student use of the telescope, Cordova said. The telescope’s history at Harvard extends all the way back to 1976. Yellowing logbooks, stuffed rather haphazardly into the drawers of a filing cabinet, are witnesses to this decades-long history. Students who took the time to look through the logbooks have occasionally stumbled across a familiar name. “Couldn’t sleep,” begins one 1:45 a.m. entry by Neil deGrasse Tyson ’80. 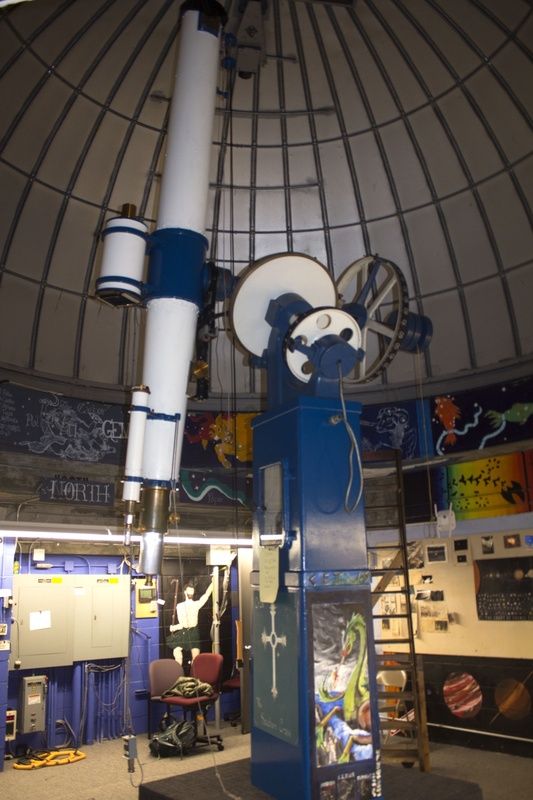 Since the telescope is outdated, the Loomis-Michael Observatory is not used for classes or research, but is primarily meant for recreational use. Students who complete a telescope training course run by STAHR receive swipe access to the observatory. Demand for the telescope course is high — while STAHR can train around 60 students per semester, over 200 apply each time the club releases applications for the class. New STAHR club member Andrew Wang ’22 said he looked forward to using the telescope to unwind during his time on campus.